In a state renowned for some of the world’s best trout fishing, Delta County in western Colorado tops the list with its pristine stretch of Gold Medal water in the Gunnison River. The cold, clear Gunny, one of the nation’s best fly fisheries, teems with huge rainbow and brown trout in Gunnison Gorge. Besides the Gunnison River, Delta County offers plenty of lakes, reservoirs, and streams for both fly and bait fishermen, including more than 300 lakes on lofty Grand Mesa and the North Fork River. While you can cast a line year round, summer is the ideal time to find your favorite Delta County fishing hole, with starry campsites, warm weather, wildflower-strewn meadows, and productive insect hatches. The Gunnison River in Delta County provides an incredibly scenic fishing experience—with some sections featuring up to 10,000 trout per river mile. 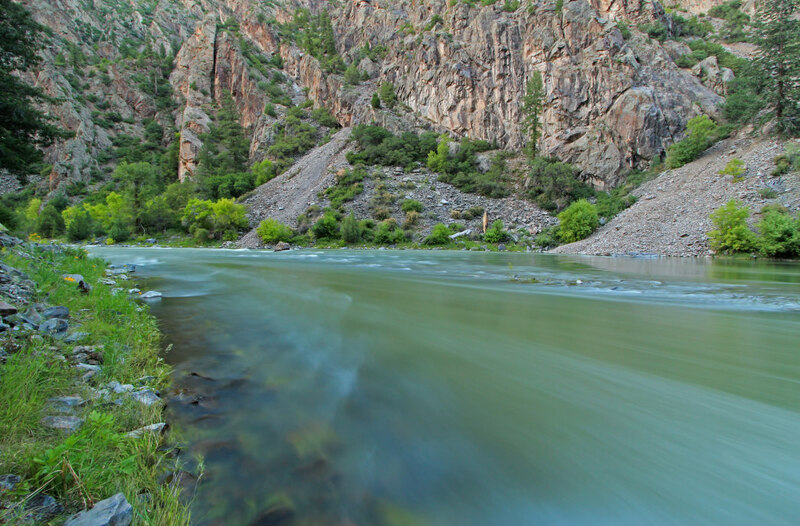 The 40-mile stretch of the Gunnison River through the Black Canyon of the Gunnison National Park and Gunnison Gorge National Recreation Area is a designated Gold Medal wild trout fishery. This section of the wild river, reached only by hiking or floating, is considered one of Colorado’s most prolific fisheries with up to 10,000 trout over six inches long per river mile. Fly fishermen often pull trophy-sized rainbow and brown trout from 12 to 20 inches long with occasional lunkers over 24 inches, so bring a big net. Expect great fishing all year, but it’s best from June through September when multiple insect hatches make the river a bug factory. The famed stonefly hatch in early June is epic, turning the river into a feeding frenzy for trout. The Gunnison River’s best fishing is along a 14-mile section through the Gunnison Gorge in Delta County. The inner canyon, lined with steep cliffs, is reached by four trails that twist down to the river from the gorge’s west rim. The Chukar and Duncan trails, reached from trailheads off Peach Valley Road east of Olathe, are most popular with anglers. The river offers superb shoreline and wade fishing with its cold water, deep pools, and quick rapids like Improvise, Paddle Keeper, and Cable. A guided float fishing trip through the Gorge is a bucket-list expedition with spectacular scenery and wilderness campsites. 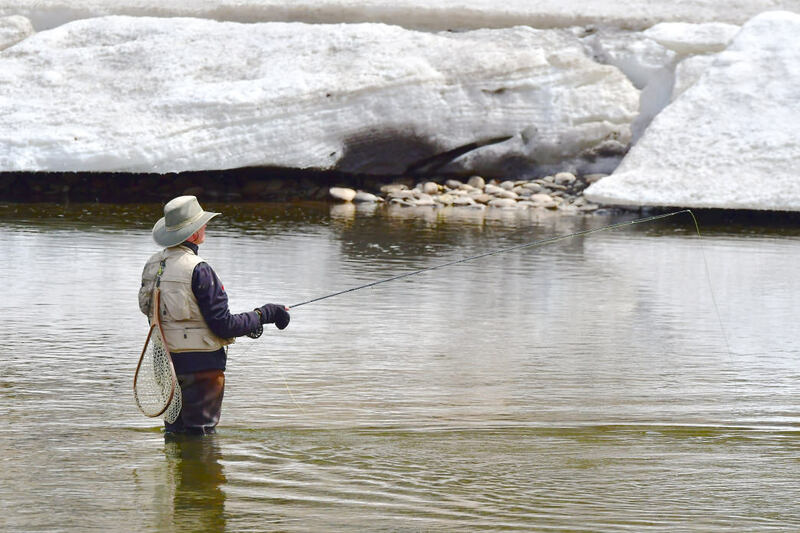 You can fish on the North Fork of the Gunnison year round. The North Fork of the Gunnison River, simply called the North Fork, meanders down a broad valley through Hotchkiss and Paonia. While private property flanks most of the river, you’ll find riffles and pools at family-friendly Paonia River Park. This reclaimed gravel mine offers trail access to the tumbling North Fork, a handicap-accessible ramp, boat launch, and picnic area. The Gunnison River Pleasure Park at the confluence of the Gunnison River and the North Fork makes a good base camp with campsites and cabins. The private facility has a fly shop, bar, fishing guide service, boat rental, and easy access to the river. They also run jet boats up lower Gunnison Gorge in the morning, ferrying wade fishermen and boats to river hot spots. Crawford Reservoir, a 400-acre lake in eastern Delta County, is the centerpiece of Crawford State Park. The glassy lake is the county’s best lower-elevation reservoir, with not only stunning scenic views of the West Elk Range and two campgrounds but also some of western Colorado’s biggest northern pike. The lake also offers excellent fishing for crappie, largemouth bass, channel catfish, yellow perch, and trout up to 17 inches long. 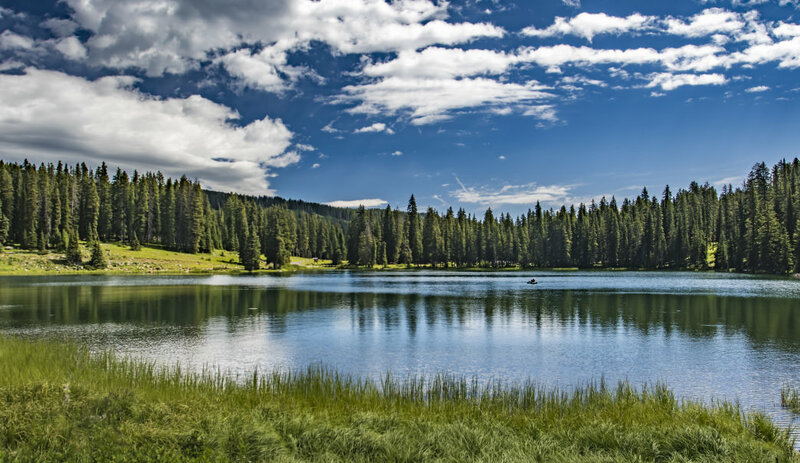 More than 300 alpine lakes on Grand Mesa provide for a pristine fishing experience surrounded by evergreen forests. Grand Mesa, called the highest flat-topped mountain in the world, is the land of 300 lakes, with ponds, lakes, and reservoirs scattered through evergreen forests and broad meadows. The mesa has an average elevation of 10,000 feet, making it the perfect summer fishing escape from lowland heat with mild days, cool nights, and plenty of trout-filled lakes. Popular fishing destinations along the Grand Mesa Scenic Byway include Island Lake, the largest on Grand Mesa, Eggleston Lake, and Baron Lake. For more fishing adventure, head east on dirt forest roads and hike to hidden ponds chock full of rainbow, brown, brook, and occasional cutthroat trout. Grand Mesa is also one of Colorado’s finest ice fishing destinations, with easy access, thick ice, and a long winter. Toss a fishing line in the heart of Delta at the confluence of the Gunnison and Uncompahgre Rivers in Confluence Park. Besides the riffling rivers, the family-friendly park offers quality fishing in 65-acre Confluence Lake. Anglers fish from the shoreline or non-motorized boats for rainbow trout lurking in the depths and for catfish, sunfish, bass, and bluegill. Access for wheelchair fishermen is a narrow finger that juts into deep water on the east side of the lake. The park also has something for everyone, with five miles of trails, a fenced dog park, picnic areas, a boat ramp, and a fireworks display on the 4th of July. Southeast of Delta is 137-acre Sweitzer Lake in Sweitzer Lake State Park. The rectangular reservoir, surrounded by farmland, was built for water-based recreation and fishing. The shallow lake is a popular local fishing hole, with anglers landing warm-water species like catfish, sunfish, carp, and bluegill. It’s a great lake for kids to learn how to bait a hook, cast a line into still water, and reel their first fish to shore. Sweitzer Lake is catch-and-release only, so throw back your catch. Don’t eat fish from the lake since they have concentrations of selenium from the shale beneath the lake. The state park also has water skiing, canoeing in a wakeless area, and picnicking. It’s also one of Delta County’s best birding areas, with more than 180 species spotted around the lake.